"Mum, could we travel the world in the same way that Phileas Fogg and Passepartout did? "The question propels me back in time, about three decades. This was the first Jules Verne book I read. I carried it home in a heavy school bag, in the darkness after an winter afternoon in the public library. I was ten, and I had to fill my long evenings, which started at sun set around half past two. I still remember the smell of the book, picked from the "Classics for children" section, and how I opened it and started reading. I knew almost nothing of Victorian England, of travelling to exotic countries, of the honour connected to a wager, of foul play or of religious customs in other cultures or of nature's peculiarities in different geographical areas. According to my memory, I finished the story that same evening, and went back to the library the very next day to check out the entire stock of Jules Verne. I might be wrong, knowing the strange turns memory takes when something is considered of special importance. It might have been two or three days later. It is a fact, though, that I read all of his novels that dark winter, one after the other, completely enthralled, completely lost in the storytelling. And as fast as I was captured, I was released again. I had that Jules Verne spell, I loved it, but I never looked back. I was done. Jules Verne made me realise the potential of books, helped me open the treasure chest of world literature, and he served as a bridge to ever bigger journeys around the literary world. I like to imagine that my journey around Jules Verne's universe took about 80 reading sessions, and that I returned the books to the library so much more enthusiastic about the world of reading that I was ready for my life as a reader. Afterwards I instinctively felt that those books should remain in my childhood, that I might find things in them I would find ludicrous or horrible now. But the initiation rite of reading Verne when I was an impressionable ten-year-old will always be a memory of great importance to me. And of course I enjoy each minute my children spend with Jules Verne. More routined globetrotters than I was, they ask different questions, and reflect more on the radically changed technology and knowledge since the time of Phileas Fogg, whereas I had difficulties understanding the cultural codes in the world - which my children recognise directly from long experience in international schools. The main plot remains exciting, and the cheesy conclusion is as rewarding as any modern "happy end" could be:"But what then? What had he really gained by all this trouble? What had he brought back from this long and weary journey?Nothing, you say? Perhaps so; nothing but a charming woman, who, strange as it may appear, made him the happiest of men!Truly, would you not for less than that make the tour around the world? "As for the question my son asked - I think it would be difficult, not to say impossible, to replicate the journey exactly like that, given the geopolitical and technological changes in the world. Luckily, we still have the option to travel with Fogg and Passepartout! Around the World in Eighty Days was first published by Jules Verne in 1873, and was introduced to an adoring public as monthly installments. Each chapter is thus seen as connected but with its own hooks and cliffhangers. The character of Phileas Fogg has become a stoic archetype for too cool operators in books to come in several genres. This is fast moving and fun, still a good read over a hundred years later. One very interesting aspect of the narrative was the portrait of the American west in the 1870s from a European perspective. I finished Around the World in 80 Days today and it was even better than I remembered from my childhood. Admittedly, the version I had read as a child was the Great Illustrated Classics edition that was, unfortunately, abridged. I felt that a reading of the unabridged classic was long overdue. Shockingly enough, I still remembered the ending 20 years later.Just the task Phileas Fogg faces in traveling the world in 80 days (in the 19th century) and the obstacles that pop up to delay his travels would make for a fabulous story, but the element of a cat-and-mouse chase really puts this book over the top! I highly recommend it for anyone who loves grand adventure stories. I can see why Jules Verne is touted as one of the finest French authors. He is deserving of all accolades! The original steampunk adventure! Written while it was still called modern! Fascinating! :)Seriously, though... Jules Verne knows how to write a fast-paced adventure with French tomfoolery and English sprats. They're buckling down to show other multi-millionaires (price adjusted) what a *real* wager is, using nothing more than a very keen mind and a talent for reading multiple departures in the paper. (You had to be there. And you also have to enjoy a period piece, too! )But that's not all, folks! The Indian Princess gets saved by the Bully Englishman! Awwww... I've almost got a picture in my head of Tarzan swinging Jane through the jungle. :)It really is a fun novel, all told. Light fun, adventure, theft, mistaken identity, and even a moral to tuck in the end of the story to send us off to dreamland. Awww. Whether or not you've read the novel or watched the movie, Jules Verne's Around the World in 80 Days is so embedded in Western culture that just about everyone knows the basic plot premise: wealthy and reticent Englishman Phileas Fogg makes gentlemanly bet with his chums that he can travel around the world in 80 days and then sets off with his temperamental French servant to do just that.The idea for the story came from the actual journey of eccentric Bostonian George Francis Train. (Who liked to refer to himself as "Citizen Train" - check out the NYTimes article from the day he finished his trip in Tacoma, WA. )What I hadn't expected of Verne's novel is that it is such a blatant reminder of how far we've come in the last 135 years since colonialist superiority was treated as unquestioned fact:"The steamer passed along near the shores, but the savage Papuans, who are in the lowest scale of humanity, but are not, as has been asserted, cannibals, did not make their appearance. "Similar descriptions applied to Punjabis, Chinese, and Native Americans are littered throughout the book. It's also clear that, at the time of writing the novel, Verne was an unabashed Anglophile. Not only is the book a celebration of the British empire at its peak, but Verne is constantly praising Fogg's alleged English qualities (honor, stoicism, courage) and jabbing at his servent Passepartout's Frenchness (temperamental, impetuous, chatty).What I found fascinating about Around the World in 80 Days has nothing to do with the book itself, but rather how Jules Verne wrote it. When he was a young boy, according to accounts of relatives, he ran away from home and attempted to sail out to sea to follow the adventures of Robinson Crusoe. Having failed, he promised his mother that "henceforth I will travel only in dream." For the rest of his writing career Verne rarely traveled. Rather he would surround himself with books and research the landscapes of his novels without ever setting foot there himself.In the words of Ethan, Jules Verne might be what you consider an OG bridgeblogger. If you have even the most remote interest in African issues then you probably follow Ethan's blog. He is incredibly talented at consuming and digesting large volumes of information about a complicated topic and then presenting that information in an easy-to-follow narrative that doesn't simplify its complexity. But in all my years of following Ethan's blog I think he's only traveled to Africa for two short conference-related trips. The obvious difference between Ethan and Jules (apart from the fact that Ethan is both nicer and more empathetic) is the number of research and communication tools that we now have at our disposal. Verne had his local library, letters, and the telegraph. Today, apart from being able to glimpse the front pages of hundreds of newspapers from around the world at the Newseum, we are also able to learn about the world around us in real time thanks to Global Voices, Facebook, YouTube, Twitter, and Google Earth. What's more, we can - and often do - develop real and meaningful friendships from our interactions on those sites.Still, there is something about being on the ground, there in person, that allows you to soak in and understand new lands, cultures, and customs in a way that even the most advanced virtual worlds could never rival. I doubt that Ethan would be such an impassioned Africaphile were it not for his time spent in Ghana. And Joi is right, if he really wants to understand the Middle East, the best thing to do is move there. (Though mentioning United Arab Emirates' tax benefits would have been a brave gesture of sincerity. )I do understand that increased international travel is neither good for our environment nor our budgets. But, done responsibly, it is good for humanity. The more we experience other cultures the more we understand about ourselves and our place in the world. Which is why I wholly support initiatives like Abby Falik's Global Citizen Year fellowship program (which hopefully won't be bogged down by the bureaucracy, legacy, and politics of Peace Corps). As Michael Naimark notes in a smart essay on the 80plus1 website, Verne's novel celebrated the technological advances of the industrial era. Thanks to the steam engine, railways, and global colonialism, it was possible for the first time to circumnavigate the globe in just 80 days. Today we're still at the dawn of a new era of technological advances: pervasive networked and structured data. These tools will lead to a new era of exploration. There are no longer new lands, tribes, and cities to discover. Just by starting up Google Earth we can cast our eyes on every hidden corner of the world. The curiosity that inspires exploration, however, remains. Something keeps Matt traveling and dancing around the world and keeps Nicholas daydreaming about his next trip to Guyana or Venezuela or Argentina. Something inspired this Chinese blogger to travel around the world in 800 days. But exploration today isn't about discovering the so-called undiscovered. It's about understanding what has been there all along. Really neat story. It was a fun view into life about a century ago.My only nit with it was with the particular audio book I heard: an annoying afterward that publisher felt he had to append. In it, he explained to us how Mr. Verne's views of other cultures are simply not acceptable to modern people such as ourselves, and although he has transgressed and used stereotypes of different cultures the book still has some value.I found it unfair and unnecessary. Verne's depiction of different cultures includes stereotypes, of course, but he goes out of his way to present a variety of individuals in each culture. Some are good, some are bad. Some fit the stereotypes, and some don't. In other words, he describes the world as he saw it. I don't need someone to explain to me that the book still has some value. This book brings so much childhood memories back. My dad just to read aloud and retell over and over again Jules Verne's stories and I'm so grateful for that. It ignited my passion for reading a long time ago, as I learned for the first time that I can travel around the world through books and stories, laying in the warm room. I can still remember the vivid images of my imagination that I had as a child listening to this story and feelings will never fade, I still felt quite emotional rereading this story and joining Mr. Fogg on his journey.Thank you, dad, and that you Mr. Verne for introducing me to the magical world of literature. More like five days for me really, though even that is too long for a 250 pages book. Well, it’s an audiobook and I only listened to it while commuting to work.Yes, that is a silly intro but what I meant is that while listening to the book I often felt transported along with Phileas Fogg and crew. This is my first Jules Verne book, normally I prefer to read books in the original language they are written in because with translated books there is always an added layer between the translator and the original text. Still, if I avoid reading translated novels altogether I would have missed out on some great literature. This edition from Librivox* was translated by George Makepeace Towle, obviously I don’t know how accurate the translation is but the prose is very readable and the narrative entertaining.I was immediately taken by the chummy tone of the narrative. Even though noting much happen in the first chapter I enjoyed Verne’s description of Phileas Fogg, a rather eccentric and enigmatic English gentleman; “exactitude personified” as Verne (or Towle?) puts it. The amusingly unflappable Fogg has a great foil in Passepartout (sounds like “passport two” in the audio). Passepartout is Fogg’s butler and sidekick, not so much Robin (as in Batman), or Jeeves, as Sancho Panza fromDon Quixote, he is bumbling, loyal and extremely likable; his IQ seems to go up and down as the plot dictates though. The basic plot of Around the World in Eighty Days is very simple, the novel tells the story of Phileas Fogg’s attempt to travel the world in no more than 80 days for a bet. He is accompanied by Passepartout, along the way they pick up a couple of characters to form an entourage and they go through several hair-raising adventures. The book is pretty much a romp from beginning to end, necessarily moving at breakneck speed as time is obviously limited and the page count is quite modest.One thing that surprises me is that Verne, a French author chooses an Englishman for his hero and Passepartout, a Frenchman, as his bumbling sidekick. Was Jules Verne an Anglophile? Let me know in the comments please. Of the other main characters, the Indian girl Aouda, who Fogg and Passepartout rescue from some zealot villains, seems to have very little in the way of agency. Then we have a Scotland Yard detective named Fix who is incredibly single-minded in his pursuit of Phileas Fogg (I keep imagining a musical adaptation of this book where he sings “I will try to Fix you”), I like him. Coming back to Fogg himself, he starts off being interestingly enigmatic and unflappable but by the end of the book seems like a one note character.“As for Phileas Fogg, it seemed just as if the typhoon were a part of his programme”That quote sums him up nicely. So Passepartout remains the novel’s best character for me.Not much left for me to say really Around the World in Eighty Days is a hoot and I recommend it. I will certainly readTwenty Thousand Leagues Under the Sea,Journey to the Center of the Earth and beyond.Jules Verne is my kind of guy!________* Audiobook from Librivox, entertainingly read by Ralph Snelson, thank you!My thanks to Lyn, an excellent GR friend and reviewer, whose review prompted me to read this book. Ottanta giorni… meno uno ! Un titolo che non ha certo bisogno di presentazioni, questo di Jules Verne, reso ancor più popolare da famose trasposizioni cinematografiche e film d’animazione. La storia è nota: un pacato gentleman inglese, il suo fido domestico francese, un caparbio ispettore di polizia, una scommessa da vincere, un viaggio in apparenza impossibile e monotono che si rivelerà, in realtà, decisamente fattibile e avventuroso.A quasi 150 anni dalla sua pubblicazione, “Il giro del mondo in ottanta giorni”, così come tanti altri romanzi di Verne, ha tutte le carte in regola per appassionare anche i lettori d’oggi. E senza distinzione d’età. Credo, infatti, che la vecchia etichetta di letteratura per ragazzi non possa che andare stretta a un libro come questo, che ha l’indiscusso merito di far viaggiare chi legge pur tra le mura di casa, trasportandolo di colpo dalle ordinate strade di Londra a quelle più caotiche delle città dell’Estremo Oriente, dalla giungla indiana alle praterie americane calpestate da mandrie di bisonti, dal Canale di Suez alle agitate acque dell’Oceano Atlantico.Trama davvero coinvolgente al punto che, con lo scorrere dei capitoli, mi sembrava di fare ormai parte del gruppetto di Phileas Fogg, mentre si sbarcava da un piroscafo per correre subito alla stazione ferroviaria a prendere il primo treno in partenza per la destinazione successiva; e si è andati non solo per mare e lungo le ferrovie del mondo, ma persino in groppa a un elefante e a bordo di una mongolfiera. Un modo di viaggiare, in verità, alquanto insolito e bislacco, sempre con l’assillo dei giorni contati; tuttavia, non meno avventuroso rispetto ad altri. Da aggiungere che la lettura in lingua originale è stata di per sé un bellissimo viaggio: la prosa di Verne, a tratti addirittura piacevolmente spiritosa, si è rivelata di un fascino singolare, pur nella sua semplicità. Ho sottolineato alcuni passi in cui le parole riescono a dipingere immagini molto suggestive, come questo che riporto:“La jeune femme, assise à l’arrière, se sentait émue en contemplant cet océan, assombri déjà par le crépuscule, qu’elle bravait sur une frêle embarcation. Au-dessus de sa tête se déployaient les voiles blanches, qui l'emportaient dans l'espace comme de grandes ailes. La goélette, soulevée par le vent, semblait voler dans l'air. La nuit vint. La lune entrait dans son premier quartier, et son insuffisante lumière devait s'éteindre bientôt dans les brumes de l'horizon. Des nuages chassaient de l'est et envahissaient déjà une partie du ciel.”Non so se l’autore abbia effettivamente visitato i luoghi di cui parla. Nel caso non li avesse visti tutti con i propri occhi, considerata la dovizia di particolari e l’accuratezza di certe descrizioni, ciò che lui ha scritto sarebbe allora doppiamente straordinario. Tra i personaggi, molto ben riuscito quello di Passepartout, atletico e scattante, talvolta un po’ pasticcione, davvero divertente poi con quel suo candido e inopportuno modo di fare nella scena conclusiva del romanzo; un bel personaggio anche quello di Fogg, capace, seppur in apparenza imperturbabile, di guizzi imprevedibili. Così come imprevedibile è il colpo di scena finale della storia, quando oramai la scommessa sembra perduta (e al quale si riferisce il titolo di questo mio commento)… Un grande classico, da leggere e rileggere, per i viaggiatori (e i sognatori) di ogni tempo! Una aventura con todas las de ley.Me pasé toda la lectura del libro soñando despierta, calculando cuánto llevaría hacer ese recorrido en la actualidad, con los transportes modernos y cuántos días de margen daría eso para que, visitando brevemente cada lugar (tampoco si das la vuelta al mundo da ir de tren en tren y de barco en barco, como en el libro)el viaje no se pase de los 80 días. Mientras soñar sea gratis y el futuro incierto, capaz algún día quién dice. Como encantarme, ¡me encantaría! V, is for Verne3 StarsA true Englishman doesn't joke when he is talking about so serious a thing as a wager.Around the World in 80 Days is a slim little adventurous classic that seems to be telling us so much more than the actual text would suggest. It’s heavily scientific jargon can be a bit much at times, and the adventure itself is interesting more than exciting. The motley cast of characters - a staid Englishman, an excitable French servant, an American cop and an Indian maiden – have such diverse and differing responses to the problems and blips that come up along the journey. It was at times very funny to read the exchanges between these characters, however overall I found this read a bit bland and certainly too scientific in content. I suspect a touch of this has to do with Fogg’s attitude towards the whole adventure. I have always believed that the living of life is in the sights and the hick-ups in your plans, this however is not an opinion Fogg would likely share with me.“Why, you are a man of heart! ""Sometimes," replied Phileas Fogg, quietly; "when I have the time.”I enjoyed all the weird misunderstandings and confusion surrounding the trip itself, more than the journey itself. Overall, this was an enjoyable read and I will definitely be reading more of Verne’s stories in the future. Although, perhaps I will wait until I am feeling a bit more finite and literal minded than I was when reading this one. The Shrinking World26 August 2016 - Rouen	I just noticed a little oddity with Goodreads in France: they used 'et' instead of 'and' when it tells you that people have liked a review. Mind you, they still use the work 'like' and opposed to 'aimer', which is a little disappointing, though apparently the word like, when used in the context of liking something on Social Media, has been taken onboard by numerous languages as apparently the Germans do something similar. I guess this is further evidence of how English is slowly embedding itself as a global language (though I can't remember if in Germany Goodreads uses 'und' instead of 'and'). Anyway, I wasn't planning on finishing this book until I had left Amiens, namely because I wanted to visit the Jules Verne house beforehand. However it turned out that while Google told me that the Jules Verne house was closed on Tuesdays that wasn't entirely correct – during the summer it is just closed in the mornings, so I managed to visit his abode the day I arrived, which meant that I could leave Amiens earlier, though unfortunately the train strike means that I have to take a detour through Paris (oh the tragedy of the situation) as opposed to going directly to Rouen. While I won't be posting this until I get to Rouen (the simcard that I purchased for my phone is absolute rubbish – the company is SFR by the way) I am using the extra time to actually write this review. Come to think of it, the train strike, and the railway carriage that I am sitting in writing this review, sort of conjours up the idea of being a part of Phineas Phogg's adventure, though he sort of has a lot more at stake than I do (it just means that I get to Rouen a lot later than I originally anticipated – not that it turns out to be a problem). One of the things that I saw in Verne's house was the route that Phogg took on his journey, though it was interesting seeing how he worked it out since there are other books, such as Robur the Conqueror, who also take similar journeys and Verne didn't want to repeat a similar journey with this one. The other thing was that it needed to be possible to do the journey in eighty days, and as such needed to take the most direct, and fastest, route possible. Mind you, it wasn't like today where you could easily make the trip in, well, three days (travelling by commercial airliner that is, though you could possibly do the trip a lot faster if you hitched a ride on a jet fighter). The whole idea of the book is to show how the world has become much much smaller (and it has become even smaller with the advent of the commercial airliner and the internet). At the beginning of the century getting from England to Australia would take six months in a leaky boat, and not much had really changed in the millenia from when people realised that they could get a horse to do all the walking, and that jumping on a log that was floating down the river was a lot quicker than crawling through the woods. Okay, roads did speed things up somewhat, as did making sure that bandits didn't harass wayward travellers, however the collapse of the Roman Empire did mean that many of these roads, while very well built, did start to decay (though quite a few of them are still being used today – in fact our tour guide at the Somme Battlefields referred to the roads as 'the Roman Roads'). The thing is that technology has made the world much smaller, though Phogg did to have some very deep pockets to enable him to make the journey, and to overcome the obstacles that got in his way every so often. However, the two main forms of transport – the train and the steamer – did a lot to make the world much smaller. In fact the idea of connecting the United States by railway did much to tame what was in a sense a wild land – the railway meant that people could move a lot faster, and troops could be deployed in places a lot quicker as well. Of course we have this famous picture of when the two lines finally met, which gives the impression that this massive continent had been conquered. However Le Tour du Monde is much more than just a diary of some eccentric guy who is trying to prove to a bunch of people that he can make the journey in an incredibly short time: there is also adventure, and mystery, thrown into it. The reason he makes the journey is because there had just been a bank robbery (the Bank of England I believe, though I didn't think one could actually rob a central bank, however that debate is a debate for another time) and the members of this private club were arguing as to how easy it would be for the robber to disappear. Phogg's argument was 'not difficult at all – in fact technology of today meant that once he was on the continent he would be gone'. The argument then moves on to how fast one could get around the world. As it turns out the police are a little suspicious of Phogg – why take a such a journey so soon after a bank robbery? So a detective, Mr Fix, decides to follow him, but as soon as he leaves Hong Kong he realises that he can't arrest him as he has left British jurisdiction (and the warrant is late in arriving), so he ends up following him on his journey. Mind you, one can't travel across the American West without being attacked by Native Americans, or be required to rescue a princes somewhere along the way (as well as visiting a Chinese opium den), so in a way this little romp around the world literally has everything (except a boxing Kangaroo, unfortunately, so here is a pic for those who missed out). Definitely classic! My girlfriend bought me this book about two years ago, considering my fondness of adventure story. I wasn't really have a chance to read it at that time, thus I had just recently read it a few days ago–and to my surprise I did "round the world" in merely less than three days.The story sets itself in the middle of 19th century, in the very capital of England, London, where Phileas Fogg and his loyal French servant Passepartout set off on a race to round the world in eighty days on a wager of twenty thousand pounds. It's one epic tale full of exotic adventures from the many places around the globe from Paris, middle east, India, Hong Kong, Japan to San Fransisco. The story is profusely rich and full of suspense, it's simply a capricious chamber of surprises that might astound you by any moment possible. It's definitely the kind of book you can't put down once you've laid your eyes on its pages. It will also gladden you to find the story ends itself with a suspenseful account of happy ending!Not only has Verne done a tremendous research to write this amazing account, it's also can be seen from the story that he, himself, is a man of adventure and traveller. His prowess as a yachtsman is easily perceivable by reading the whole account of the magnificent journey of Phileas Fogg and his companions through the seas of the world.I believe there are several ways to enjoy this book to the fullest, mine was to read it with the company of a slab of cheese cake with a pot of chamomile to wash it down, also by not forgetting a huge map of the world on the table to keep track the journey of the intrepid gentlemen around the world in the comfort of my study room while occasionally gazing at the heavy rain outside my window. The other ways, of course, you'll have to find out yourself! Three nights ago, I could not sleep and was not in the mood to read any of the books I was then, and still am, in the middle of reading. So I decided I pluck one of the classics from the bedside bookshelf and just so happened to pick out an old favourite, Around the World in Eighty Days by Jules Verne.When I was younger, and while most others my age were reading Harry Potter or Twilight, I would read Jules Verne, Mark Twain, Jack London, etc. And I loved them, despite only being able to understand them half of the time. Admittedly, this was probably what has made me somewhat of a book snob. But it is one of the many reasons why I love classics so much.Therefore, it was a thrill to be able to read this beloved book again. Although I do remember 20, 000 Leagues Under the Sea being my favourite, so now I will have to re-read that too.It was actually even better than I remember. Perhaps because I can understand the big words more now that I am older... From the beginning, I was hooked. Verne's style is as matter of fact as his famous character, Phileas Fogg. But it is also witty and charming and absolutely clever. Verne was a genius. A man who was so far ahead of his time, it's outstanding.I honestly cannot find a single flaw in this book. Perhaps I am blinded by sentiment and nostalgia. But besides that, this is still a very good book. What an excellent start to the year! I just remember that there was a movie adaptation of this classic on early 2000, that casts some of the famous Hollywoord actors such as Jackie Chan and Arnold Schwarzenegger. I never had a chance to see the said movie; and now I'm thinking of watching it to check if they follow the spectacular storyline of this book.I love all the protagonists in this novel — even Detective Fix who later became an ally in Mr. Fogg's mission to travel the world. I'm not very much fond of travelling; but this book made me realize some of the benefits or advantages of doing it once in while. Jules Verne's books never fails to amaze readers on how brilliant his novels are — they are quite detailed, extraordinary, and will leave anyone to anticipate the upcoming events. I'm trying to read some of this works and next on my list is either Journey To The Center of the Earth or The Mysterious Island, whichever I purchased a copy first. 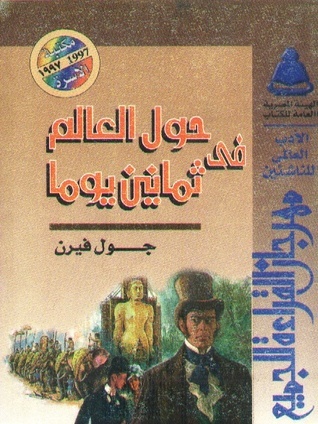 Jules Verne صبري الفضل - Jules Gabriel Verne was a French author who pioneered the genre of science-fiction. He is best known for his novels Journey to the Center of the Earth (1864), Twenty Thousand Leagues Under the Sea (1870), and Around the World in Eighty Days (1873). Verne wrote about space, air, and underwater travel before navigable aircraft and practical submarines were invented, and before any means of space travel had been devised. He is the third most translated author of all time, behind Disney Productions and Agatha Christie. His prominent novels have been made into films. Verne, along with H. G. Wells, is often referred to as the "Father of Science Fiction".